When I tasted this Pizza Cipolla, I had one of those jump up and down, "oh-em-gee this is so freaking good" moments. I kind of suspected it would be good when it was baking, because the aroma coming from my oven was spectacular. This pizza is super thin and crispy. The dough is mixed by hand, and requires very little effort to make. 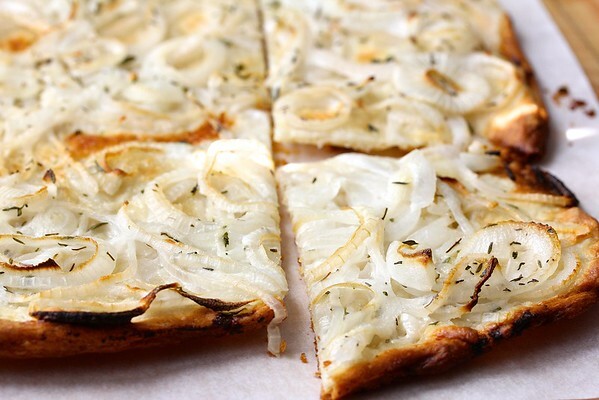 While this pizza appears to be a simple flatbread topped with onions, it is far from simple tasting. The onions are tossed in heavy cream and seasoned with salt and fresh thyme, and the resulting flavor is incredible. This crust recipe is definitely going to be my "go-to" for flat bread pizza. The crust itself is cracker thin, but holds up well to the onion topping. I love this pizza. It's an amazing appetizer or lunch. I am not ashamed to admit that had leftovers for breakfast. Two days in a row. This bread is crunchy crisp, crisp, crisp!! And if you're one of those people who is skeptical about onions, I encourage you to give this a chance. After baking, the onions transform into roasted sweet deliciousness. 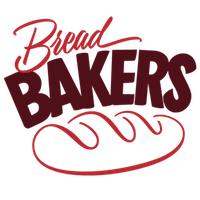 The theme for this month's #BreadBakers is Summer Bounty! I received a huge bounty of onions from my cousin, with which I've been cooking and baking all month long. After the recipe, check out all of the Summer Bounty links from my fellow #BreadBakers. Whisk the dry ingredients for the crust together in a medium bowl. Add the water and mix it into the dough with a dough whisk or your hands until all of the flour is incorporated, no more than a minute. Cover the bowl with plastic wrap and let sit until doubled, about 2 hours. When the dough is ready, drizzle about 2 tablespoons of olive oil into a half sheet pan and spread it with your hands to coat the pan. Place the dough in the half sheet pan, and stretch it out to a long column to fit the middle of the pan. With your fingers, begin to press the dough to the sides of the pan. This may take awhile. When the dough resists your efforts, let it rest for a bit while you work on the topping. Eventually, your dough should just about cover the entire pan. Slice the onions into 1/8 inch slices. A mandoline slicer makes this super easy. Place the onions into a medium bowl, add the cream, salt, and thyme, and toss together to coat the onions. Evenly top the crust with the onions, making sure they cover the crust from edge to edge. Bake the pizza for 30 to 35 minutes, until everything begins to turn golden and the crust begins to pull away from the sides of the pan. Recipe slightly adapted from Jim Lahey's My Bread. I'm shocked that there would be leftovers for breakfast! 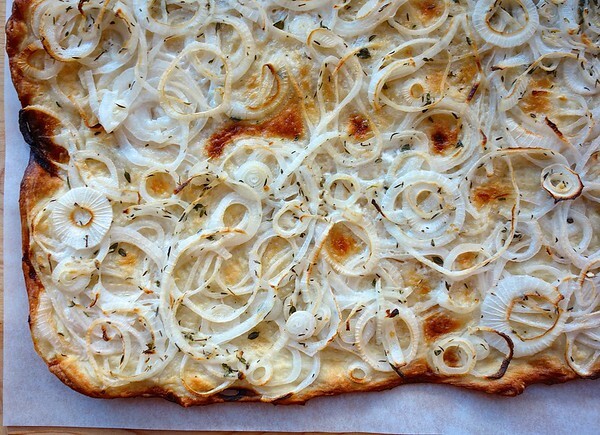 This bread looks amazing (I'm a huge fan of onions)!!! you have yeast 2 times? This looks incredible! Sometimes the simple things are the best and you really can't go wrong with onions. I would have eaten this pizza for breakfast too! I love how the crust is thin and crunchy, and would be perfect for so many toppings. I am sure the onions were sweet and creamy too. If you know somebody skeptical about onions you should dismiss them.....you don't need that kind of negativity in your life LOL. Looks scrumptious!! That has my name written all over, love it!! So simple and delicious, great recipe. This looks uuuuuuuh-mazing!!! We have something similar in Germany and it's called Flammkuchen. Thank you for reminding me of this deliciousness. Will have to try soon! 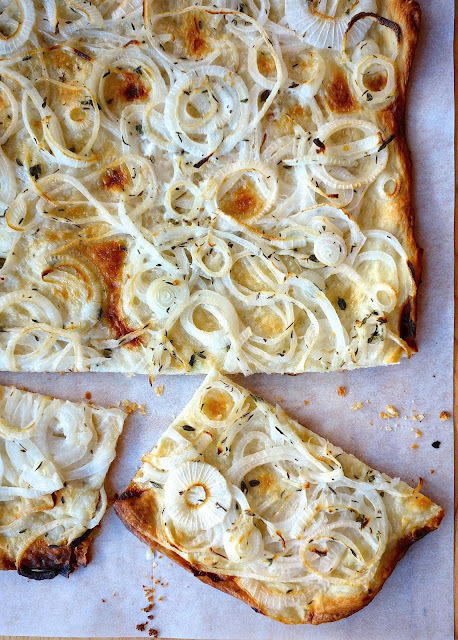 I have topped pizza with onions before but never thought to make a creamy topping -- this sounds fabulous. Can't wait to make it to share with friends on a Friday evening cocktail get together. Thanks so much!! I do have a Yummly button on the left. Share this didn't have a Yum button when I set it up. Maybe they do now? For some strange reason we didn't notice that (our mistake)! :) Yummed! Thanx for clarifying and for the wonderful recipe dear Karen! What a simple and lovely way to use herbs and onions with a bread base. If I had tomatoes and a bit of basil (maybe a slice or two of fresh mozzarrella for good measure), this could be dinner. What a fortuitous coincidence. I happen to have all the ingredients for this because my daughter came back with extra cream from a grocery store run last week and my son bought 2 bags of onions this morning. I will miss them when school starts next week--no more elbow deep in chopping veggies for salsa when I realize I'm out of onions, just send the kid! After 4 days of canning the last thing I wanted was an involved project in the kitchen, so I thawed a package of naan from the freezer and used your topping on grilled naan pizzas. I love that!!! That sounds amazing!! This bread would go great with French Onion soup! Leftover pizza is my favorite breakfast. In fact, I often make or order extra, just to have leftovers. What a beautiful pizza, Karen. I am intrigued by the cream. Gotta try this! I love raw onions too. These are even better! I'm struggling to come up with the words to say how incredible this flatbread looks. None seem to really describe it adequately and my brain is distracted by dreaming about devouring the whole thing. You just made my day Renee! 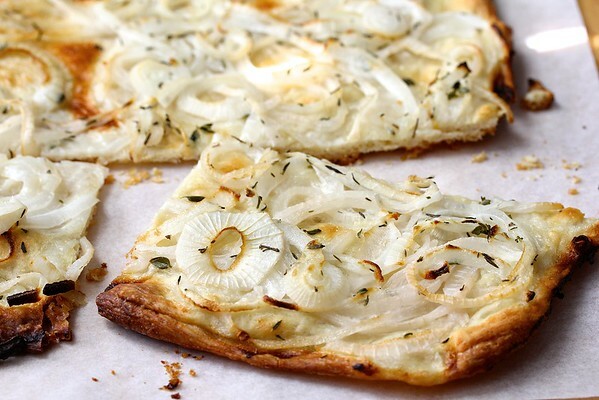 Wow, your onion pizza looks incredible. I can almost taste it. Will have to make it soon to enjoy it myself :-) Thanks for the recipe. Onion pizza looks amazing.. Would love to try this sometime.. It's been way too long since I've made a homemade pizza crust! Thanks for this delicious looking inspiration!